One thing I love about cooking is that it can transport you to another place. Different flavors and techniques are used all over the world. When you are not able to travel, cooking food from different cultures is the next best thing. Cooking various ethnic foods has gotten me through this bad case of the travel flu. I love exploring the different flavors of each country and culture. Each combination has something completely different to offer. This recipe is a delicious combination of Mediterranean flavors. The olive tapenade is complimented by a tangy chive and olive oil blend, both of which add strong flavors to an already delicious cut of grilled mahi mahi. Combine 2 tbsp garlic, 2 tbsp olive oil, ½ tsp salt, ¼ tsp pepper and all of the oregano to a small bowl. Coat the fish in this mixture, cover and chill for 1 hour. Meanwhile, soak the olives in cold water for 30 minutes then drain and chop. Combine 4 tbsp olive oil and the chives in a food processor until a sauce-like mixture forms. Heat 2 tbsp olive oil in a skillet over medium-high heat. Sauté the shallots until soft (about 2 minutes). Add the garlic, thyme and olive and cook until heated through (about 3 minutes). Add the remaining salt and pepper to the olives, remove from heat, cover and keep warm. Remove the mahi mahi from the refridgerator and grill until cooked through and fish flakes easily with a fork (about 4 minutes per side). 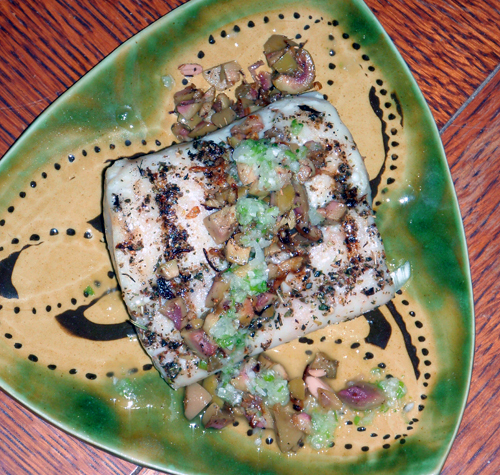 Spoon the olive mixture over the top of each piece of fish and drizzle with the chive mixture before serving. 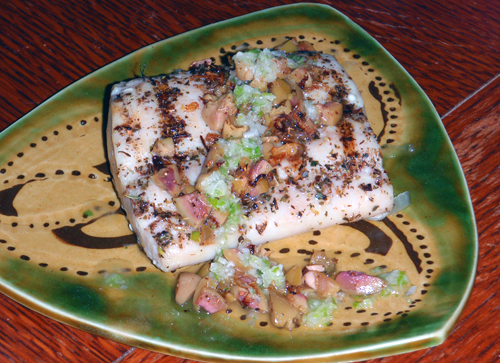 Mahi Mahi is one of the best fish and I usually only prepare it for a special occasion. I really like the tapenade recipe here and the picture looks tasty. I have printed this one-thanks for sharing-buzz! We discovered a similar recipe for fish a few months ago and now it is our favorite way to prepare fish, I think it has to do with the olives…. I especially like that your tapenade has 10 cloves of garlic, the more the better! Thanks for sharing! Mmm mahi mahi just went on sale at my market so now I’m going to have to try this since you made me crave it! I think I always have the travel flu – good thing we are going to San Francisco and Italy soon!!! Nothing like a vacation to get you planning your next. We have a huge case of this right now, and are trying to figure out how to fit one in!